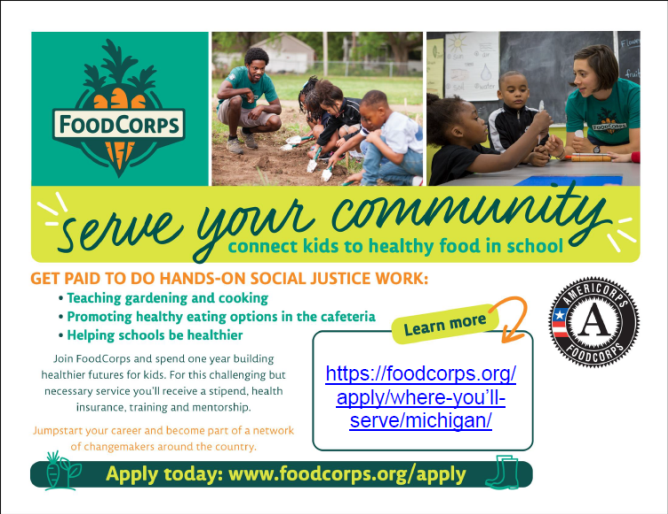 Michigan Farm To School - Blog: FoodCorps Recruitment for the 2018/2019 term is open!!! FoodCorps Recruitment for the 2018/2019 term is open!!! FoodCorps Recruitment for the 2018/2019 service term is open!!! Applications Open for Service Positions as School Food Change-makers! 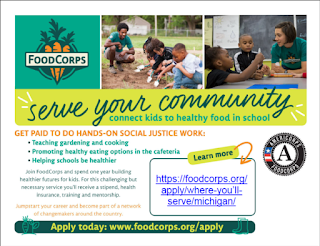 Michigan – January 17, 2018 - FoodCorps, a national organization that connects children in limited resource communities to healthy food in school, opens applications for its seventh annual class of AmeriCorps service members. The selected community leaders will dedicate one year of full-time, paid public service in school food systems – teaching hands-on lessons in growing, cooking and tasting food, collaborating with food service staff to steer students towards the healthiest options in the cafeteria, and working alongside school administrators and teachers to foster a school wide culture of health. "What we feed our children in school––and what we teach them about food there––shapes their health and success over a lifetime. By joining FoodCorps, you will have a chance to do something incredibly important: connect children in your community to healthy food, and give them the opportunity to grow, learn and thrive,” said Curt Ellis, FoodCorps co-founder and Chief Executive Officer. Applications are due by March 15th, 2018. Emerging leaders interested in getting more information should go to https://foodcorps.org/apply. FoodCorps is a nationwide team of AmeriCorps leaders who connect kids to healthy food in school. FoodCorps places these leaders in limited-resource schools for a year of public service where they teach hands-on lessons in growing, cooking and tasting food, collaborate with food service staff to steer students towards the healthiest options in the cafeteria, and work alongside school administrators and teachers to foster a school wide culture of health.